There are some blogs that are so smart and intellectual. I read them and think, "boy, maybe I should focus on something that sounds really smart. Like deconstructing the history of the internet." But then I come across something wonderful. I'm easily distracted by the shiny object. Today, I found something incredible. I've talked about Pat Prichard on here before. 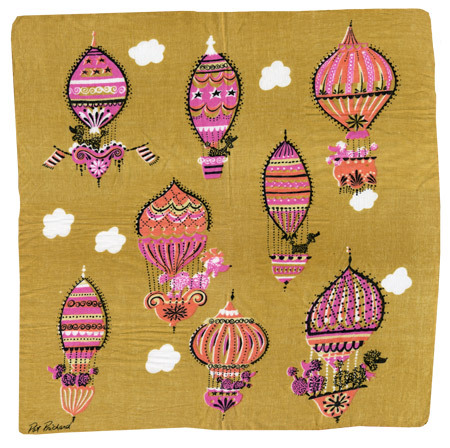 She was an amazing illustrator who left her mark on handkerchiefs, dish towels, dinnerware, and other textiles. I'm an avid fan. Going through a box of textiles today, I came across a collection of Pat Prichard materials. 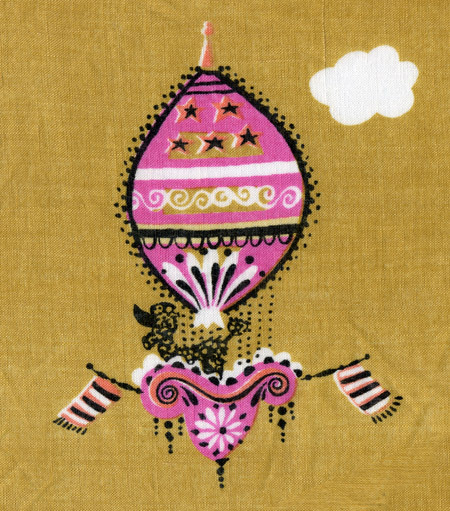 How can I talk about deconstruction when I am faced with a handkerchief of poodles in hot air balloons. Genius. I do question the sanity of the creator. How do you get there? Do you sit at your desk and think, "Gee, I like poodles. And I really like hot air balloons. What if I put them together?" Maybe it's a French poodle, French hot air balloon combination. Whatever the process, it resulted in a joyous and playful object. Now if I only had wallpaper like this.